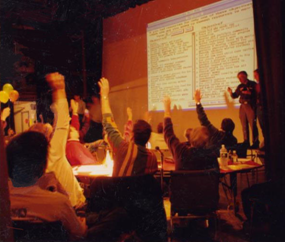 In January of 1996 REM sponsored a Community Catalyst Process with the help of the folks of The Center for Consensual Democracy and a computer assisted planning process designed and led by Dr. Michael Kelly. 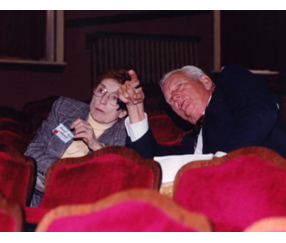 This 3 day planning process on the stage of the Waterville Opera House involved more than 250 area citizens. 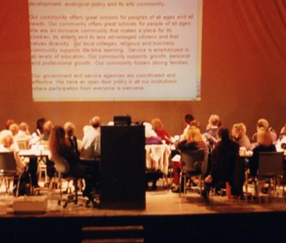 Primary to the process was a group of 48 people referred to as the Dream Team…carefully chosen to represent the demographics and diversity of our local community. Interested people from as far away as Washington DC came to observe the process. People in the audience who had ideas they wanted included sent notes via ushers to the stage where the ideas were presented by members of the Dream Team. Those ideas were then entered into the computer and became part of the permanent record of the event. Every idea was projected on the wall of the stage and everyone on the stage and in the audience could see. The entire first day was a visioning process. Every word spoken was written and anyone who wanted to make a change could do so. At the end of the day the Mid-Maine Strategic Vision for the Year 2020 was signed by every participant. In the 2012 Inauguration of Mayor Karen Heck the entire statement was printed on the back of the inauguration program. Mayor Heck was one of the 48 Dream Team Members. Day two included a brainstorming process to answer the question, “if this is your vision, what initiatives must we undertake to make this vision a reality? 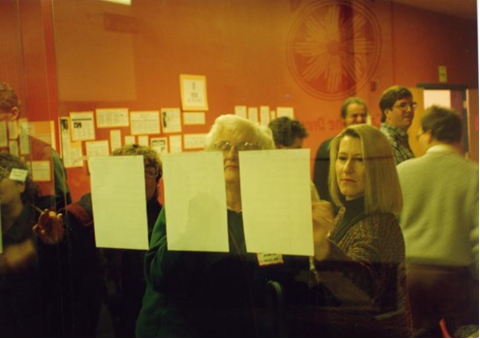 Every idea was recorded for all to see and the day culminated with an opportunity for the community to vote to determine which of the hundreds of initiatives were the ones they felt most important to accomplish. Those receiving the most votes were then sorted into categories and the categories were then prioritized. There were 8 prioritized objectives. These 8 prioritized community objectives are the focus of all of REM’s work to this day. Every Community initiative in REM is organized under one of these objectives. Under each priority the following initiatives were decided upon. Objectives are listed in order of priority. Within each Objective, Initiatives are listed in order of priority. Complete the walking/ running path between Waterville, Fairfield, etc. Create a waterfront park with interesting architecture like the Tivoli, etc.